PHILADELPHIA -- You can't go more than a few steps around this Stanley Cup Final without running into some Chris Pronger talk. In these parts, Pronger is a hero of epic proportions, and in Chicago, he has been fitted with a black hat. But this is nothing new for Pronger, especially during the playoffs. "It's old hat now," Pronger said of being the villain in the playoffs. "It is what it is. I think we all understand the game is there for good entertainment. People are paying a lot of money to see a good game. If they want to love to hate somebody, then so be it." The whole "puck gate" thing after Games 1 and 2 in Chicago certainly helped to cement the black hat on Pronger's head, but just as importantly it has been Pronger's play on the ice, where he has helped keep Dustin Byfuglien away from the Flyers' net during the first three games that also makes him unpopular in Chicago and a star in Philadelphia. "You guys made it Pronger against Byfuglien, I didn't," Flyers coach Peter Laviolette said. "It's Pronger against the guys that he's out on the ice against. And they're good players. He plays against that line (Byfuglien, Jonathan Toews, Patrick Kane) quite a bit. Byfuglien is on it. But the other guys are pretty good hockey players as well. I think he's done a good job defensively, along with Matt Carle. I think all of our defensemen played pretty well to this point." Blackhawks coach Joel Quenneville was asked if he thought about shaking up his lines to get his three top forwards away from Pronger. Quenneville pointed out a fact that makes it next to impossible. "He's out there for more than half the game, so that's easier said than done if you are looking for that matchup to be avoided.," Quenneville said, noting Pronger is averaging around 30 minutes per game. "It is what it is," Toews said. "He's going to go out there and be physical. It doesn't matter how many whacks you're going to take from a guy like that in front of their net, the second you turn around and give him one, you have to be careful, because that's what they're looking for is retaliation. "It's that type of thing where you have to try and accept and take from him, because it's the way he plays," Toews said. "It just seems like, you know, it doesn't go as noticed as it would for another player. That's just the way it is. He's done his job. We can still do more to try and take him off his game." But as Toews pointed out, the Hawks have gone up against tough players in other series and now must keep on keeping on. "It's always been about us and been about how we can play better," Toews said. "That doesn't change in this series, so we've played against some tough defensive players in the past in previous series before coming into this one. It's all about overcoming that adversity, overcoming the obstacles that are in front of you and just finding a way." But for the Flyers, there is no question Pronger is an inspiration. 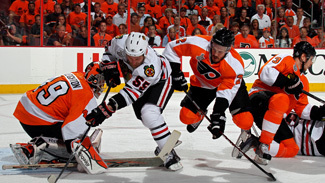 "He is amazing and seems to be getting better and better with every game in the playoffs," Danny Briere said. "Eating more and more minutes, it seems. That's another guy -- aside from our coach, he's the only one with a Stanley Cup. His demeanor, his calmness in the dressing room, he just brings a lot of confidence. "You look at him and you realize he's been there before. He knows what he's doing. Took a lot of the pressure away from his teammates with the puck situation. I don't know if it was really on purpose or if it's Eager -- Ben Eager that made it bigger than it really was. I don't know. He just seems very sure of himself, and it trickles down to the rest of the team, I believe. But his play has been amazing." More praise for Tallon -- Dale Tallon is now the general manager of the Florida Panthers, but he still is held in very high regard by the players he brought to Chicago. "I remember, personally, when I was drafted by Chicago, I remember he was the guy doing all the interviewing," defenseman Duncan Keith said. "I'm not exactly sure what his title was at the time, but I got the feeling that he really pushed for them to draft me. I could tell that he was pushing for them to pick me. I'm thankful for him for that. And a lot of guys have stories like that where he's behind the players and he really cares for his players and believes in them. That's the type of guy he is. It's great to see him being able to get that opportunity with Florida. I wish him all the best." "It's great for him," Jonathan Toews said. "A lot of guys in the locker room talked to him and sent him a word of congratulations. We heard about that. "It was tough to see that happen to a guy -- to a person like Dale, the same way with Denis Savard," Toews said of Tallon leaving the Blackhawks. "Sometimes it's the reality of the business. You realize as a young player that not everything stays the same over time, but especially when somebody puts a lot of faith in you and they give you the opportunities that Dale did, it's tough. You feel kind of personally responsible sometimes too. It's tough to see a person like that go. Great to see him get a second chance." Fatigue factor -- With the regular season, Olympics and now four playoff rounds, there has been talk of players like Mike Richards, Chris Pronger, Jonathan Toews and Patrick Kane starting to slow down. "I don't think so," Flyers coach Peter Laviolette said. "You're talking about … I'm not going to bet on that, anyway. They are elite athletes. I think the teams are somewhat comparable in that way. The goaltending situation for both groups, and some good defensemen, some young leaders up front, some veteran players added in. I think there's comparison in the make-ups of the lineups," Laviolette said. "They're great hockey players. I don't think fatigue is a factor on either team right now. And the only reason why I say that is because the hockey has been too good." "It's not about what your body is going through," Toews said. "It's about what you got in your head and how bad you want it, I guess. How many guys are lucky enough to be in this situation where they can play some important games like some of the guys on our team have this year? It's been a lot of fun. It's one of those years that you got to really appreciate and make the best of, because you don't know when it's going to happen again, to make it this far in the playoffs, it's incredible. It's not about the amount of games that you play. "You just keep pushing because you know what's on the line and you know how special it could be if you are lucky enough to win a Stanley Cup or something like that, so a lot of stuff you have to play through. But it's worth it in the end."